In what was billed as possibly an offensive battle, the Seattle Seahawks and Los Angeles Rams fought a defensive slugfest, ultimately dominated by five turnovers by the Rams and a trio of Blair Walsh field goals in a 16-10 Seahawks victory. Seahawks QB Russell Wilson did toss a four-yard touchdown pass to Jimmy Graham in the second quarter, but Seattle was only able to gain 241 total yards and were subject to two turnovers themselves. On the opposite side of the field, Rams QB Jared Goff threw two interceptions and a fumble while RB Todd Gurley and WR Tavon Austin (who did record the Rams only TD, a 27-yard run) each coughed up a fumble to account for the five turnovers for Los Angeles on the day. The inability to hold on to the football was ultimately the undoing for the Rams, who dropped their home record to just 1-2 on the year. With that, we give you our PFF exclusive takeaways from the contest for each team. It was a tough game for Wilson, who found himself running for his life more often than not it seemed. Because of his offensive line’s inability to keep the Rams pass-rush under control, Wilson had to get the ball away quickly and with short passes. He averaged just 5.4 yards per attempt and 24 of his 37 passes travelled under 10 yards in the air. He only attempted three deep passes (20-plus yards in the air) and didn’t complete any of them. While the Seahawks’ passing game struggled, it seemed that every time Wilson needed a completion, he looked to his TE Graham. Even though he only had 37 yards receiving, he had six big catches with a few of those for key first downs. All of his targets were under 10 yards in the air, as he became Wilson’s safety-blanket for whenever the pressure was getting home. Graham also added a surprisingly good 82.0 run blocking grade, something he’s struggled with at times in his career. Big players make big plays. In a game of inches, the contribution of Thomas was decisive. First, in having the range to get across to not just prevent Todd Gurley scoring a touchdown but also creating a fumble out of bounds, and later in picking up a huge interception. That may have dropped into his lap, but with one other pass break up Thomas continues to show why he is the best center fielder in the league. There are some big question marks on Clark, especially with the status of Cliff Avril up in the air. His start to the season has epitomized the Seahawks pass-rushing regression, so it was big for him to show up with a huge effort here. Coming into this game Andrew Whitworth had given up just one pressure the entire year. But Clark did what most can’t, and picked up only the 11th sack Whitworth has allowed in his last 36 games. That he was also able to force a fumble that turned into three crucial points made it all the sweeter. Clark had been near the bottom of our defensive end rankings with ill discipline a problem, and while there was a penalty here, performances like will see him continue shooting up the rankings. When you go up against the Legion of Boom, you find those windows that little bit smaller than you’re used to. Goff, who came into the game completing 66.7. percent of his passes, was off target throughout, unable to challenge the aggressive Seahawks coverage unit consistently. He was unfortunate with both of his interceptions to some degree, but he just wasn’t accurate enough, especially outside the numbers. There he completed just three of 14 passes thrown further than 10 yards down the field and beyond the numbers, a figure that is not good enough. His blocking may not inspire confidence, but a career day by Higbee showed another weapon developing in this young and exciting Rams offense. His ability to work the middle of the field and down the seam in particular could really a dimension to this attack, and caused Seattle a lot of problems. His 3.63 yards per route for the game were the fourth-most of any tight end this week. 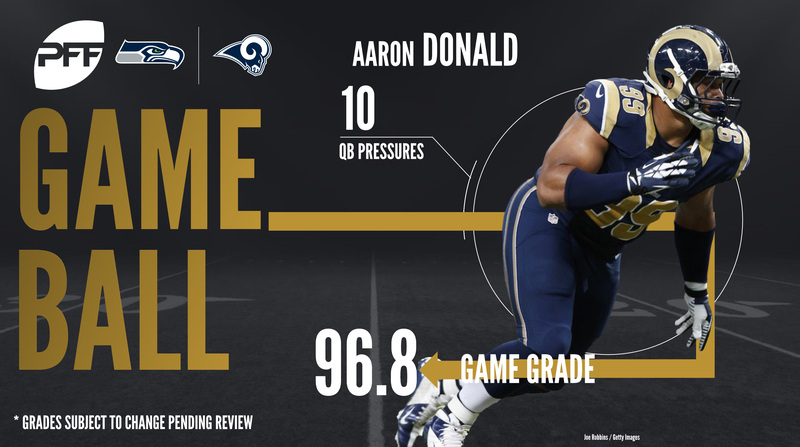 In what was a dominant matchup that many predicted, Donald absolutely manhandled the Seattle offensive line all game long. He made three solo run stops that contributed to his 94.9 run defense grade. Then he racked up two quarterback hits and eight additional hurries rushing the passer. That led to a pass-rush grade of 91.7 for the game. Davis was impressive all game long for the Rams defense, as he helped keep the Seahawks passing game under control. Davis was only targeted three times as the primary coverage player, but he didnt allow a catch and had one pass defense and an interception. He also added three solo defensive stops which helped lead to his second-highest grade of the game.